Having recently been to London it struck me that no matter how amazing this metropolis is, there are many establishments that still cannot serve up a decent cup of coffee. All I want and I suspect that the majority of people really want is a strong white coffee topped with a bit of foam to prove that the milk was heated before it got poured into the cup. Instead what you get more often than not is a scalding cup of wishy-washy coffee that singes your taste buds on first contact! But my caffeine rage does not stop there. “Hi, what may I get you today?” (Said in strained American customer service tone). This menagerie of different options serves only to confuse me. If like me, you are not 100% sure what each is you then spend a few minutes reading the descriptions. Then there are all the different milk options to go through: whole milk, 2%, non-fat and soy. Eventually, you settle for a latte as it’s the only one you actually recognise. When you think it’s all over, “Which size sir?” By now you can hear the disgruntled people behind you shuffling their feet and you still haven’t got round to establishing size! And here, in Planet Starbucks, the coffee world turns language on its head – tall means small and grande is medium. Other coffee chains also use their own size terminology: primo, medio and Massimo. 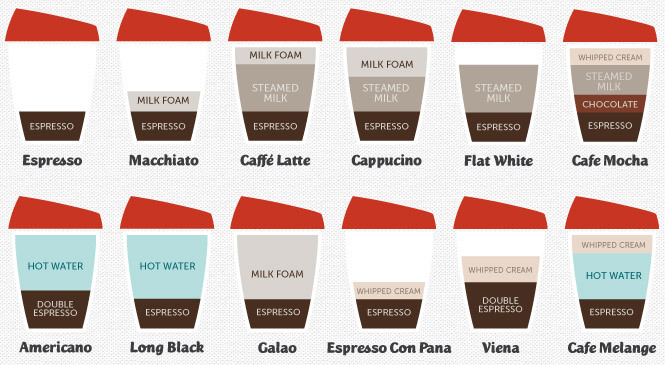 So how does a nation of tea drinkers actually cope with this coffee-confusion? International coffee chains have, over the years, converted many people into barista coffee drinkers; swigging gallons of the stuff every year. Culturally, we are still mere babies in comparison to the French and Italian; drinking coffee is a cultural heritage and is probably protected by UNESCO! In France and Italy, milky coffee is only served at breakfast and ordering a latte or cappuccino after 10am is a cardinal sin. Espresso, as the name suggests is a quick caffeine shot – not to be lingered over; is drunk throughout the day. And even though the thought of this after dinner might stir insomniac nightmares, the habit of drinking an espresso after a heavy meal is intended to perk you up as well as to help aid digestion. So you move away from the counter clutching your cup of grande double shot, extra froth, vanilla, dry soy skinny cappuccino you make your way out into the world thinking that the experience wasn’t so bad – you actually quite liked it. You have memorised how to ask for your coffee and now know what is expected. Eventually, you walk into another coffee shop and place your order only to be told that in their establishment it’s either a cup or a mug!